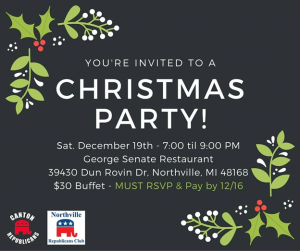 Join us for a Christmas party and networking event among local Republican Clubs. All are invited regardless of political affiliation. The $30 includes a top of the line buffet of Filet Minon, Chicken Lemonato, Postitio, Oven Roasted Potatoes, Green Beans, Greek Salad, Garlic Bread, Dessert, and all soft drinks included. The additional funds will go to local charities. This includes tip, and tax, etc. We are also planning on other fun ideas! 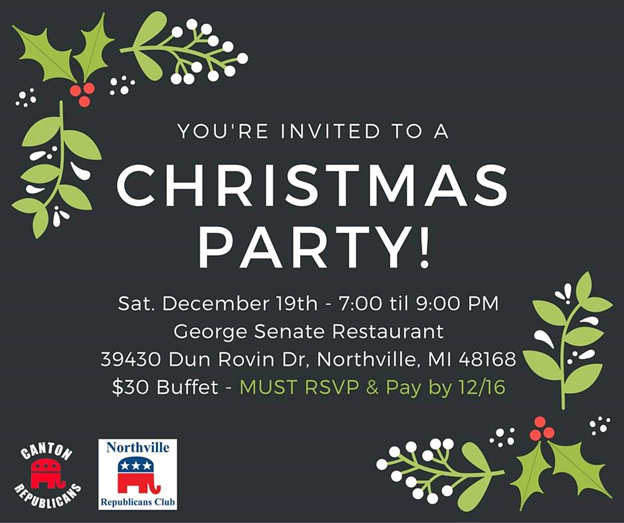 We need to get a pretty close number by and pay for event by 12/16 so please contact either club if you have further questions.